Minard Park Soccer Field Renovation project is under way. Please excuse our mess while we are renovating the soccer field at this park. 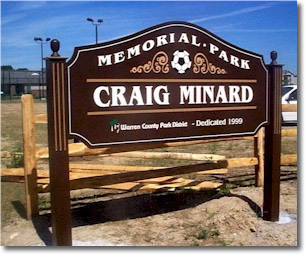 The Craig Minard Memorial Park is centered in a residential setting on Fields Ertel Road with a commercial background on Fields Ertel Rd. 2 miles south of I-71 and 12.5 miles southwest of Lebanon. 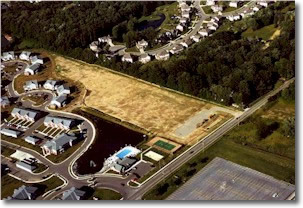 The 6-acre tract of land was a gift from David Carney, Mallard Crossing LTD. Mr Carney purchased the land from former owner Morrison Nursery for a multiple housing development and set aside 6 acres for parkland for recreation in the community as well as the housing development. The following is a list of donors who assisted in the development of the Minard Memorial Park: Deerfield Township $25,000, The Skyler Foundation $12,500, David Carney $12,500 and $4,500 for retention pond, John and Gayle Minard donated $5,000 to fund drinking fountain. The roadway and parking area was funded through Ohio Department of Transportation Park District Allocation Road Improvement Fund, in the amount of $11,607.01. 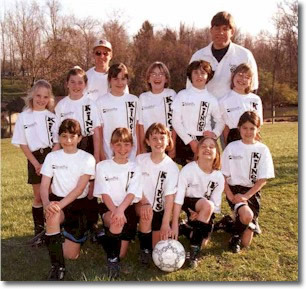 Approximately 4 acres are open space suitable for one soccer field and one instructional field. There is one picnic shelter with tables and grills, a playground area and a drinking fountain, a paved parking lot with space for approximately 30 vehicles. Poorly drained soil that formed in the Loess and Illinoian age glacial. Soil type is Avonburg silt nearly level to sloping. Located in the southwest section of Warren County. Family and company picnics. Local soccer teams use fields for practice. The playground is primarily used by the housing development.